Longleaf pine ecosystems may be the key to creating more drought resilient forests and help sustain crucial plant and animal habitat. Dwain G. Luce Professor of Forestry, Lisa Samuelson, who is also an AU Alumni Professor and the Director of the Center for Longleaf Pine Ecosystems in the School of Forestry and Wildlife Sciences, leads a Longleaf Pine Experimental Drought Study in Marion County, Georgia. “There is increased interest in the restoration of longleaf pine forests for forest products, a variety of important ecosystem services and, more recently, as a species resistant to disturbances associated with changes in climate,” said Samuelson. Along with Samuelson, Research Associate Tom Stokes and graduate students Michael Ramirez, Jake Blackstock and Caren Mendonca work to collect field data and perform analyses. “It’s a great opportunity to learn forest ecophysiological processes as well as conduct my own research from a respected physiologist like Samuelson. She requires you take the next step even when you may be apprehensive about the next challenge. She is excellent in providing positive feedback and constructive criticism to make you a better scientist,” Blackstock. “Due to the challenges related to climate and water availability, a better understanding of ecosystem behavior is needed to improve the management and conservation of our forests,” Mendonca. Assistant Professor Sanjiv Kumar and graduate student Ashutosh Pandey will conduct the modeling experiments to study soil moisture dynamics using the Community Land Model. “Our study is unique in that we are removing precipitation to study drought effects, whereas most studies utilize irrigation to remove drought effects rather than create drought,” said Samuelson. 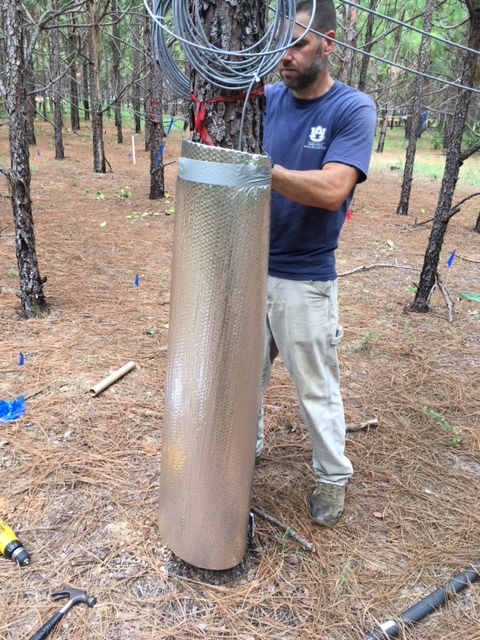 To remove approximately 40% of the precipitation, the team installed rainfall exclusion troughs that work by catching rainfall and transporting the water away from the tree roots and the experimental plots. “There have been very few drought manipulation studies done in forests with large trees, because of the expense and difficulty in constructing the exclusion troughs and instrumenting the site,” said Samuelson. The team monitors soil water availability, tree water relations, stand transpiration, leaf physiology, soil and ecosystem carbon fluxes, needle and shoot phenology, and tree growth. 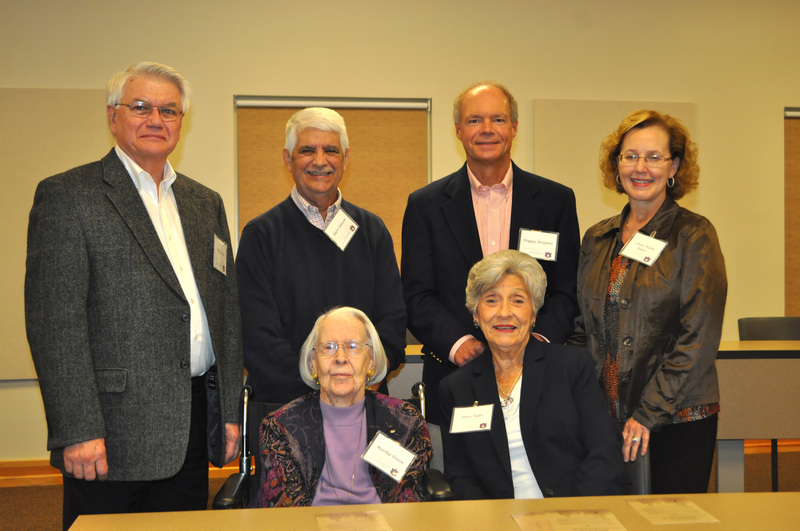 “Being part of this research is very important to me. 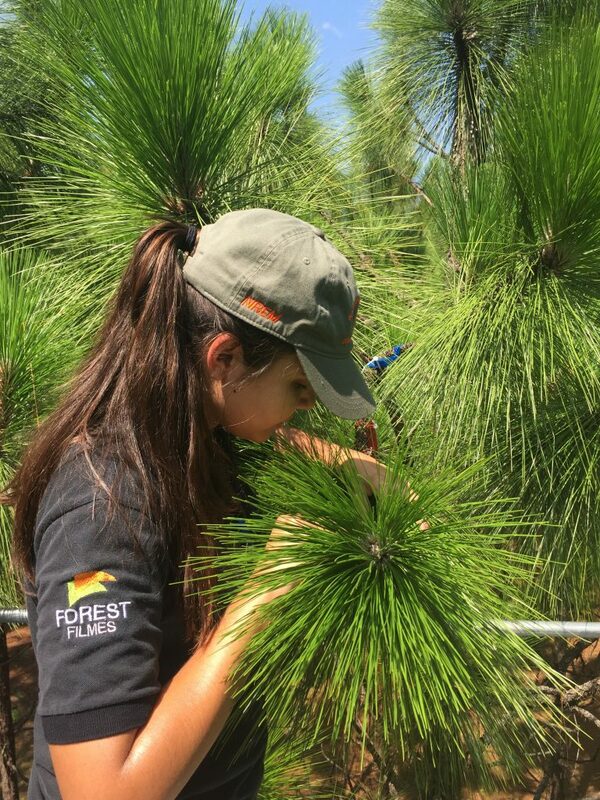 In addition to having the chance to learn more about these topics related to forest ecophysiology, we have the chance to conduct our own research at the graduate level, which has great value in our professional career,” Mendonca. The research team uses extensive monitoring equipment, including sap flow probes and 30 foot tall scaffolding to study leaf and crown water relations, photosynthesis and phenology. “We are studying more than growth. We are examining above and belowground mechanisms that control tree growth and survival,” said Samuelson. 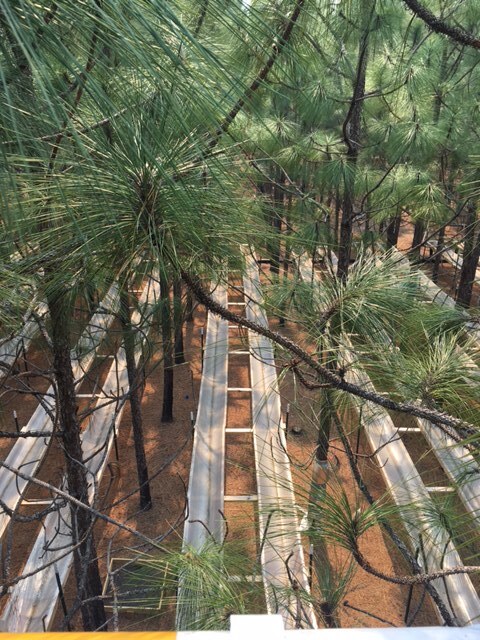 The research site owned by the Georgia Department of Natural Resources and managed by The Nature Conservancy is located in an 11-year old longleaf pine plantation. “The study is located on ACUB (Army Compatible Use Buffer) lands, which are important in lessening environmental constraints on Fort Benning and in coordinating habitat conservation planning,” said Samuelson. “As humans, we only have a limited amount of land and it is in our best interest to conserve and manage that land appropriately for future generations,” said Blackstock. Upscale site level understanding of soil moisture dynamics to improve predictability of drought at the regional scale and at inter-seasonal to inter-annual time scales. 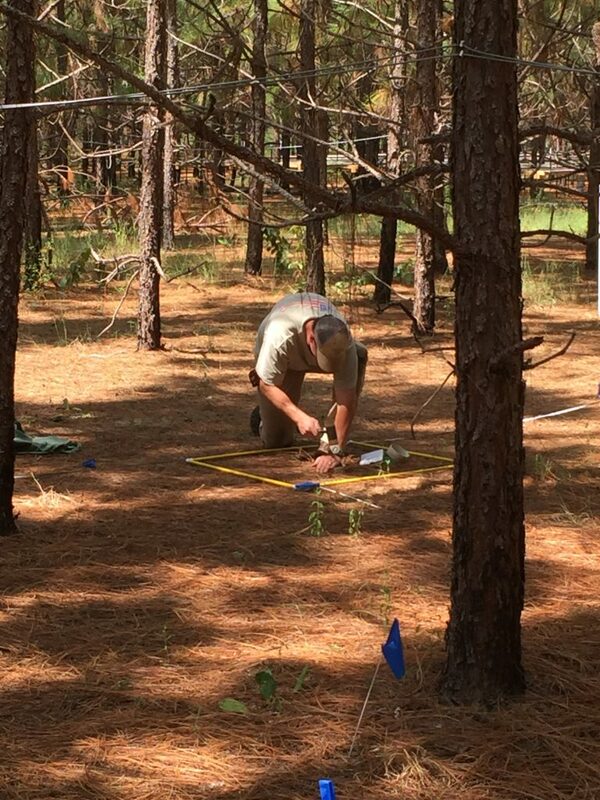 “Our research will provide information on the current and future vulnerability of longleaf pine to drought. The data will also be used in parameterizing process-based models that simulate longleaf pine growth under varying climate and fire regimes,” explained Samuelson. 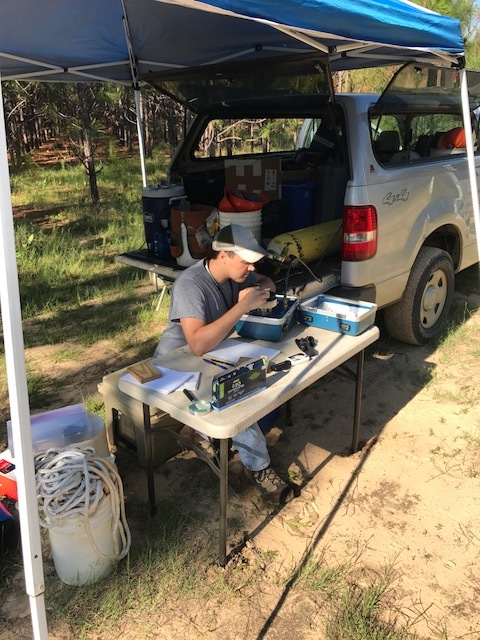 “I hope the impact of this research is more awareness of the consequences of drought on longleaf pine forests and improvement in the management of southern forests,” Mendonca. The research from the study will be published in various journals including Tree Physiology; Forest Ecology and Management; Trees Structure and Function; and Ecological Applications. “Our ultimate goal is to gain a better understanding of the role of longleaf pine in creating resilient forests for the future,” said Samuelson.